DCI.org's Christina Mavroudis-Dempsey catches up with Crossmen drum major Evan Woods, a 21-year-old from Flemming, Ohio, after the corps' performance at the Coltrin & Associates DCI Southeastern Championship on July 29. Woods talks about recent changes to the end of Crossmen's 2006 production, "Changing Lanes," and how well the corps performed those changes that night. 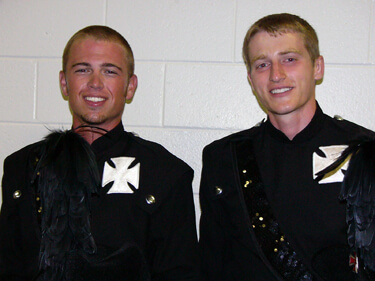 Crossmen drum majors Jarrett Lipman and Evan Woods.